April 19, 2013 -- In 1918, an elderly women suffering from dementia attended a church program featuring former President Theodore Roosevelt. Pointing at Roosevelt, she asked the usher if "that there man" was going to speak. "What man?" the usher asked. "I can't remember his name," the old woman replied, "but it's the chap I always thought would make a good advertisement for a dentist. He's got wonderful teeth, and always shows them." Even a toothy smiling Aztec figurine unearthed in Mexico City in 1916 was likened to the ex-president. A Chicago newspaper claimed the figurine was "an Aztec deity and in its day was worshipped pretty much as thousands of this country now worship our own Teddy." Theodore ("TR" or "Teddy") was known as the first smiling president. He was often photographed or illustrated "grinning from ear to ear." According to Arden Christen, professor emeritus of Indiana University School of Dentistry, "His flashing white teeth, wide smile, and engaging openness became welcome symbols of national and international acceptance." He was born with near perfect teeth that protruded in a broad, friendly smile, which became his symbol. One scholar referred to his teeth as "ferocious." 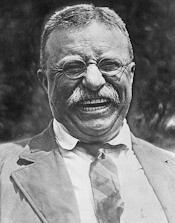 Unlike prior presidents (many of whom had bad teeth), Roosevelt's were near perfect, and he used them to his advantage. standing there, gazing at her and showing all its sharp, white teeth?" "Teddy Roosevelt!" one boy volunteered.